Whenever I have leftover vegetables in the house, my favorite way to recycle them is on a pizza. My mother’s method of making pizza is to start with a thick crust and cook in a low oven (around 325 degrees) for 45 minutes to 1 hour. This will provide you with a crisp crust and bottom, but moist center pieces. As I’ve stated before, I’m not a baker. I’ve made my own pizza dough in the past, but I’ve never made it enough to become proficient at it. 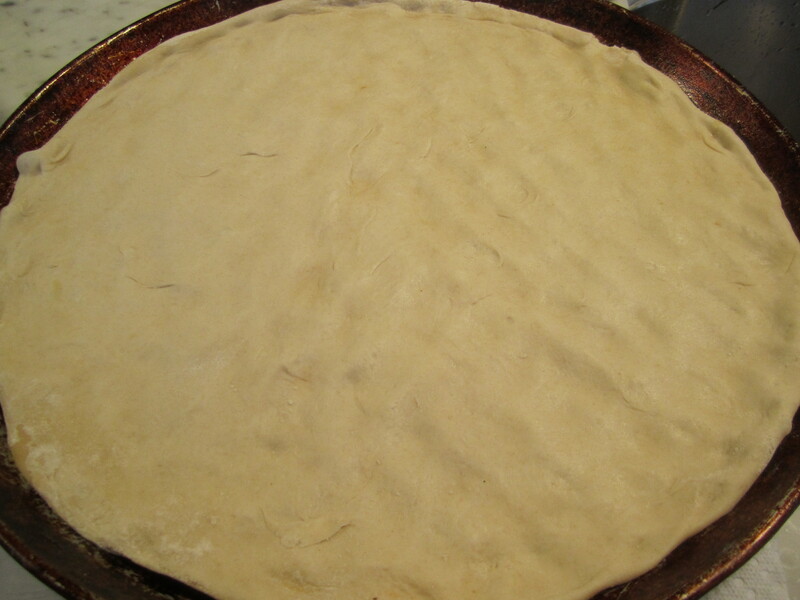 Working with dough–particularly yeast dough requires a familiarity with the “feel” of the dough. There are days when the humidity is higher and the dough requires more flour and less liquid than on other days. You must know how much or how little to kneed the dough, etc. Therefore, to make my foolproof pizza, I buy the pizza dough from my favorite pizzeria. This allows me to concentrate on the toppings. The sauce for pizza is a bit different from sauce for pasta. I use whole peeled tomatoes (or my mother’s home canned tomatoes). The sauce doesn’t need to be cooked (although if you have some leftover pasta sauce, by all means, use it). The sauce, in my opinion, must be very oily and rich. In the blender, I combine the whole peeled tomatoes with a good amount of extra-virgin olive oil until it has formed an emulsion and has turned more orange than red. Then I remove the sauce from the blender and add some fresh chopped oregano leaves and basil leaves (don’t process the herbs in the blender or else the sauce may become too pungent). Taste and add salt. Add a tablespoon of oil to the pizza pans and spread the dough out evenly on each pan. 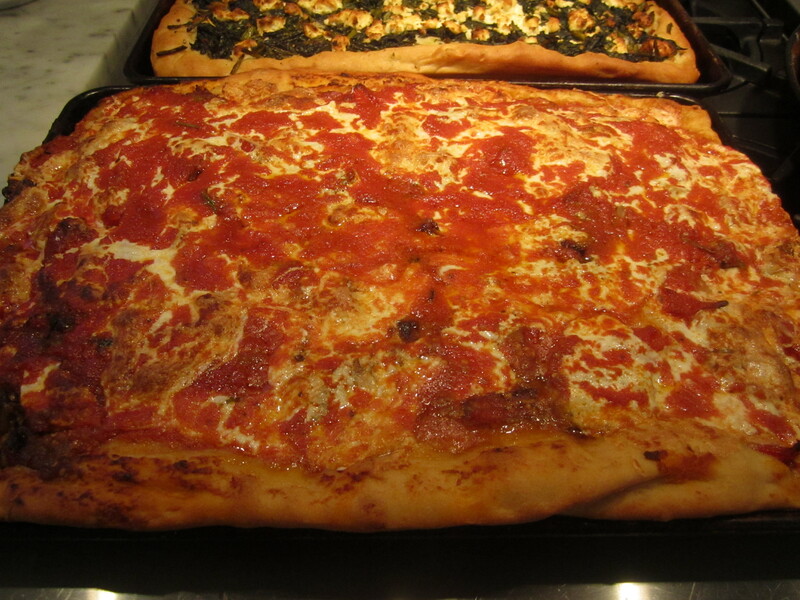 These pizzas will be on the thicker side (the dough should be about 1/2″ thick when spread out). This may necessitate using more than one round of pizza dough per pizza (simply piece them together and spread them evenly). The mozzarella is sliced by hand as thinly as possible–I prefer this to shredded mozzarella. 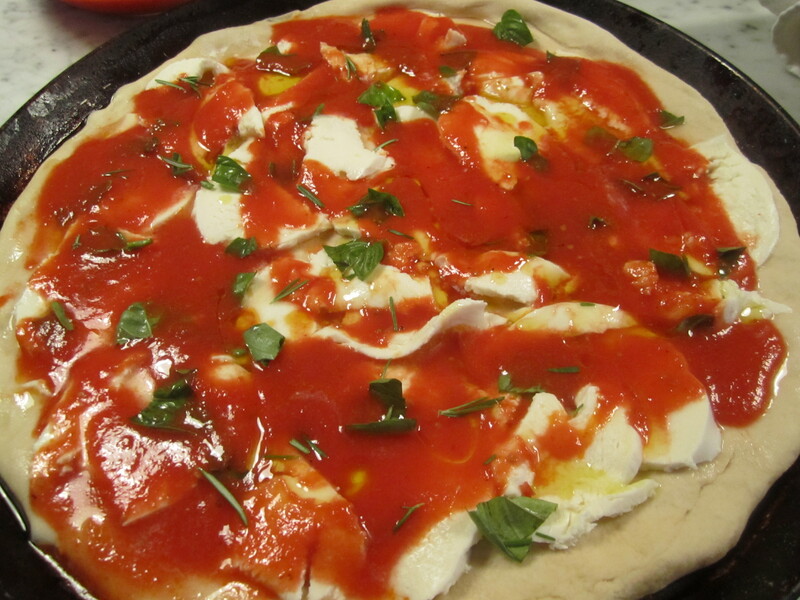 One of the interesting things about my mother’s pizza is that she places the mozzarella and any toppings on the dough before the sauce–the sauce comes last and covers the other ingredients. Because these will bake for a while, this prevents the mozzarella and toppings from drying out and overcooking–it works brilliantly. Which brings me to additional toppings–the most fun part of making pizza. Tonight I have two fun toppings to use in addition to tomato and mozzarella. 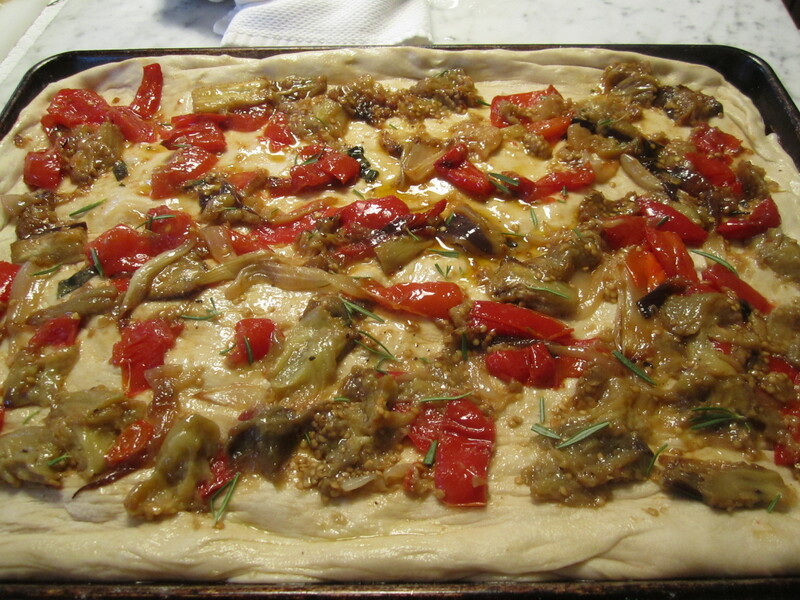 You may recall that I made roasted eggplant, peppers and tomato the other day–those leftovers are PERFECT for pizza. In addition, I have those wonderful unblemished beet greens and some goat cheese left from my golden beet and goat cheese salad the other day. 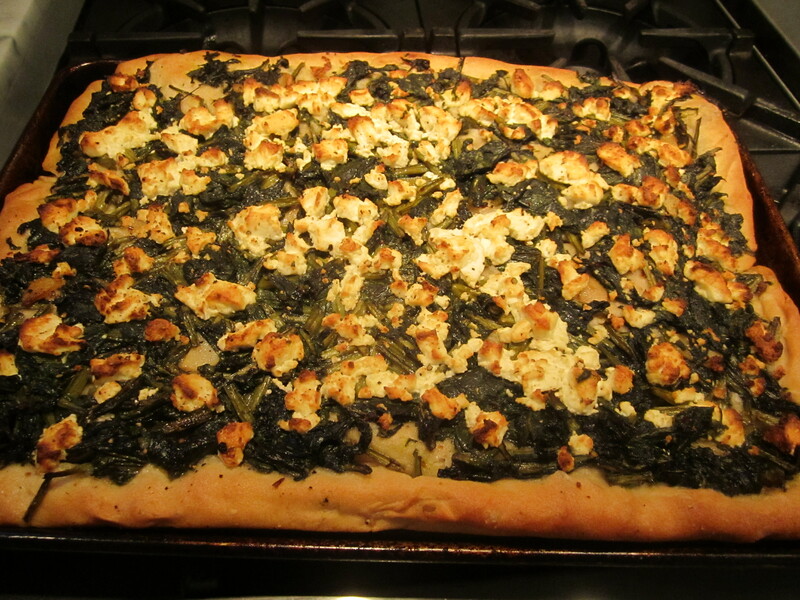 Those have been boiled and sauteed with lots of garlic and chili flakes, for a great greens and goat cheese pizza. 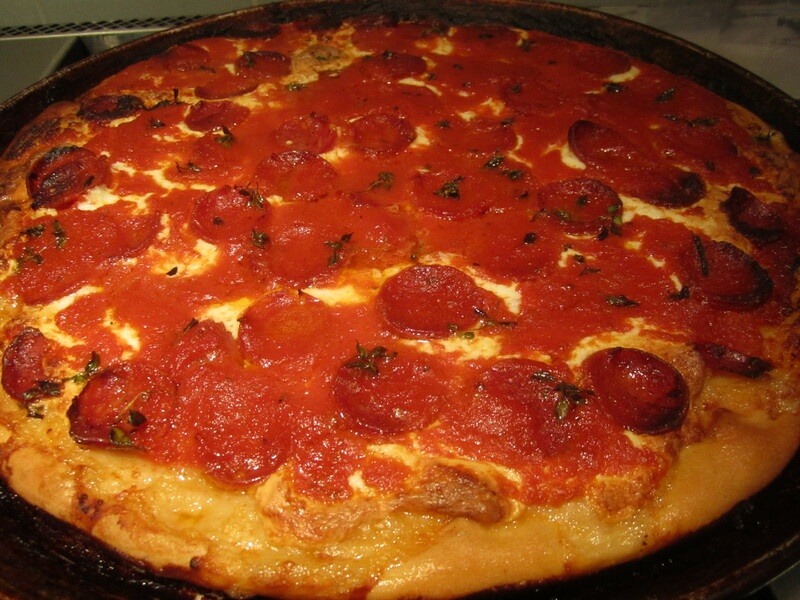 Pizza night wouldn’t be complete without a cured sausage pizza. This sausage is one I buy at Citarella Market, and is a Calabrese-style sausage (not to be confused with the American sausage known as pepperoni). Sliced thinly, it sheds some of its wonderfully fragrant fat into the pizza and once you try it, you’ll never go back to pepperoni. 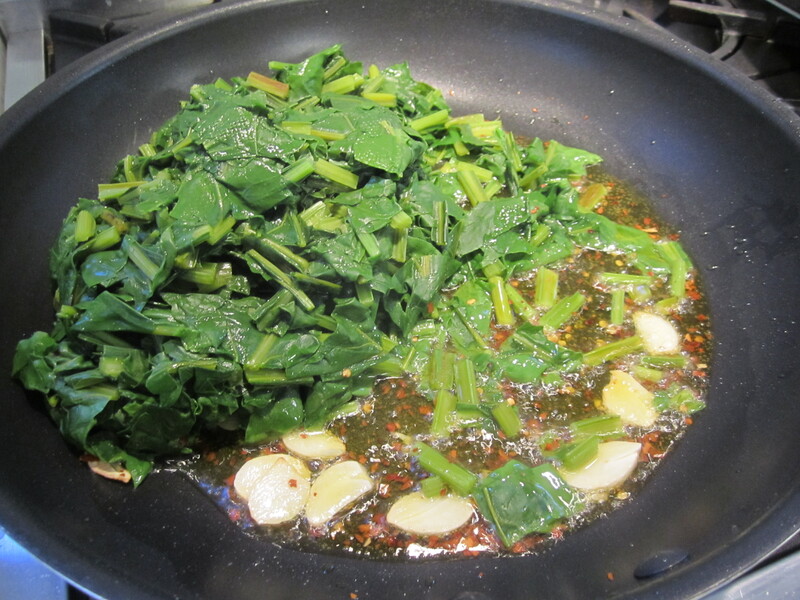 Before I added the rest of the sauce, I took the photo below to give you an idea of the proportions of ingredients. 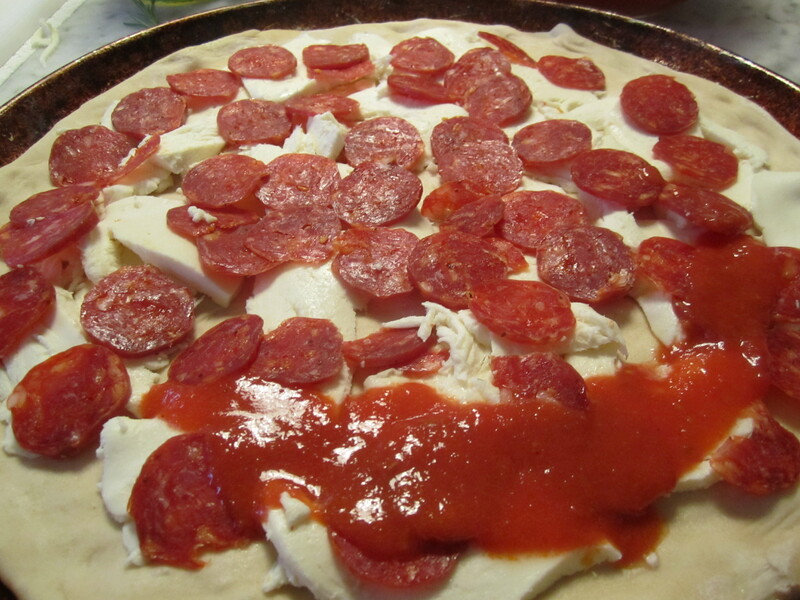 I’ll give you the sauce recipe, but for making the pizzas on this post, the photos will be most helpful in guiding you to figure out the amount of topping and proportions of ingredients to use on your pizza. To assemble the basic margherita pizza spread a layer of cheese, then top heavily with sauce and small pieces of freshly snipped oregano and basil. In addition, you’ll notice a couple of needles of fresh rosemary–my neighbor, Beppi’s suggestion. Drizzle liberally with extra-virgin olive oil. For the roasted eggplant and pepper pizza, the same formula applies–place toppings and cheese on the dough first, then add sauce on top. See the proportions in the photo below. Once again, I’ve added the sauce after photgraphing. 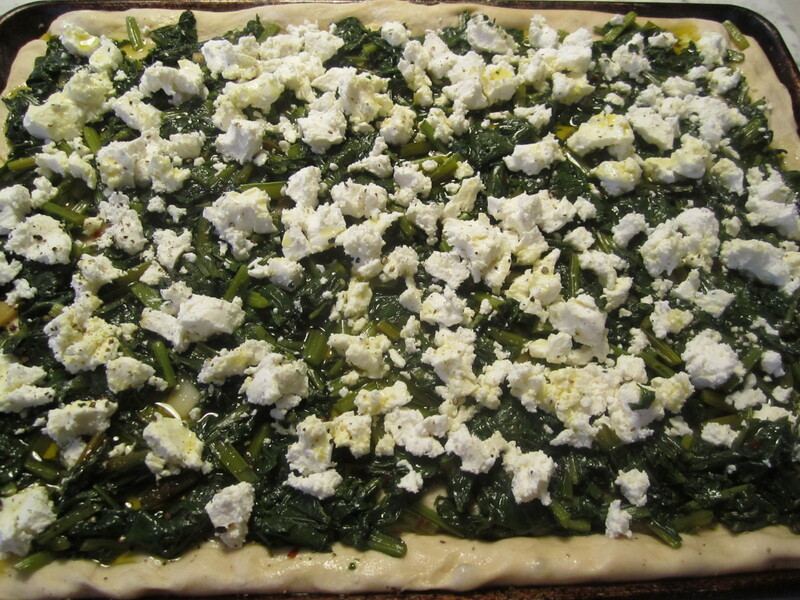 The only pizza I’m making without tomato sauce is with beet greens and goat cheese. To keep this pizza moist, use an extra-liberal amount of olive oil drizzled on top (several tablespoons). Bake all for about 45 minutes to one hour, depending on the strength of your oven. Because I had so many pizzas in one oven, I used convection, but it’s not absolutely necessary. To test for doneness, make sure the edges are a nice deep golden color, then lift the crust and make sure the bottom is lightly golden as well. Blend tomatoes and oil in blender to emulsify. Add in chopped herbs and stir by hand.